Lacquers plated by Gary Salstrom, 200-gram pressings by Quality Record Pressings, gatefold jacket! 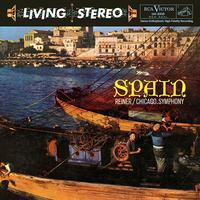 This record includes Falla's Dance from the Three-Cornered Hat and La Vida Breve and Albeniz's Trina from Oberia. Transcribed for Orchestra by Arbos. Great performances and sensational sonics! Among Spaniards there is no greater composer than Manuel de Falla — the tang of the country, the swirl of its landscape, the passion of its people are proudly stamped on every note he wrote. Goyescas, written in 1915 by the Spanish composer Enrique Granados, was the first opera performed in Spanish at the Metropolitan Opera in New York City at its premier in January 1916. The Intermezzo from the opera, inspired by the paintings of Francisco Goya, became a popular independent concert piece. Spanish composer Isaac Albéniz composed the Iberia suite for piano between 1905 and 1909. It was his best-known work and considered his masterpiece.